Every year it seems like a fresh and exciting new voice in the horror genre makes a splash on the big screen. Two years ago it was comedian turned horror auteur Jordan Peele with Get Out, the Academy Award winning horror-comedy that instantly became a pillar of pop culture and memes. Now, Peele has managed to maintain an even footing on the horror hill by delivering Us, a satisfying sophomore effort that has a similar DNA to Get Out, but is its own type of movie with an even tougher shell to crack, and that’s what makes it special too. With Us, Peele has crafted another twisty, high-concept horror picture that plays out in the same Twilight Zone manner of Get Out. Lupita Nyong’o’s Adelaide suffers a traumatic experience as a child, and can’t escape it as an adult, especially when her family returns to the place where it happened decades later. 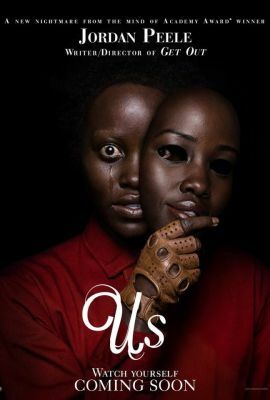 Though her husband, Gabe (played by a very Peele-esque Winston Duke) assures her things will be fine, they certainly aren’t as a group of red-clad doppelgangers of their family attack the home in horrific and unexpected ways. Nyong’o delivers a double performance for the ages with Us, two sides that are more than just the heads or tails of a coin but the varying sides of a Rubix Cube. From the fierce and familial sides of Adelaide to the cold and calculating sides of her doppelganger Red, the performances work in a dance that intertwine them and mix them together. It’s mystifying to see them both share the screen and Nyong’o manages to create such diametric personalities between them that you often have to remind yourself they’re both the same person. All around the entire cast is fantastic. Duke’s dorky dad Gabe is another stand-out, often the comedic relief for tense moments and the subverter of expectations as we all would expect the big dad to handle the situation, which he seldom does. Shahadi Wright Joseph and Evan Alex play the children of Nyong’o and Duke’s characters as well as their own doppelgangers, bringing a grounded reality to the film’s heightened world. Subtle gestures move mountains in Us, and it’s the evil faces that create the most deliberate actions. There’s a piece of cloth for every audience member to latch onto in this narrative, be they young, old, single, married, and the cast’s ability to nail these performances is why it works. What Us really solidifies is how much Jordan Peele understands this genre as a filmmaker. In the same way that Quentin Tarantino made a brand new stamp in the realm of crime fiction with his first two movies, and influenced a generation for how to tell these stories, Peele has twisted and spun the horror genre into shapes that we recognize but with means that are unique and wholly his own. Get Out and Us don’t rely on the same types of tropes or even influences from the horror genre, but they play with our expectations and take hard lefts when we’re expecting rights. He uses our expectations against us by making his monsters do the unexpected. Naturally they taunt, they toy, they chase, and they attack, but it’s seldom in a way we foresee. Peele also knows that we’re trying to figure out the ending before he can get there, which makes the third act of the film perhaps lose some steam as it pulls its brakes to catch us up on a world we weren’t expecting (and which I won’t ruin). There’s also the matter of crafting stories around our own awareness of pop culture, both horror themed and not. Peele knows we’ve seen The Strangers, Funny Games, and The Purge movies. He knows we’re expecting the things we’ve already seen, and he flatly denies us those things. There’s also a piece of pop culture that broadcasts a lot of the movie early on in the film, and I have to applaud Jordan Peele for taking what seems like a simple “It’s the 80s!” reference and working the entire plot of his movie into a giant reference toward that specific thing. Like Get Out though, there’s more to the world of Us than the second act will have you believe, which is what makes Peele as a storyteller so fascinating. Horror stories certainly can be as simple as “people in masks break into house,” but why stop there? Why not push the limits and the audience into fascinating new places? On the surface, Us is a challenging movie, a film that doesn’t wear its themes like a bright vest but instead requires a more exhaustive examination, and perhaps repeat viewings. There’s a clear mark of upper vs lower class at work along with a lot of things to say about our willingness to hide our worst tendencies, to the detriment of our own lives and the world around us. How do we as people balance self preservation versus familial care? How do justify our bad decisions? There are a lot of tough questions at the heart of Us, which is about the most poignant way to summarize the film and the meaning of life anyway. Not that we have all the answers, but neither does Us; it’s there to make us question our world. The post Us Review appeared first on ComingSoon.net.